Hartford is home to historic and cultural attractions, many of which you can see absolutely free. 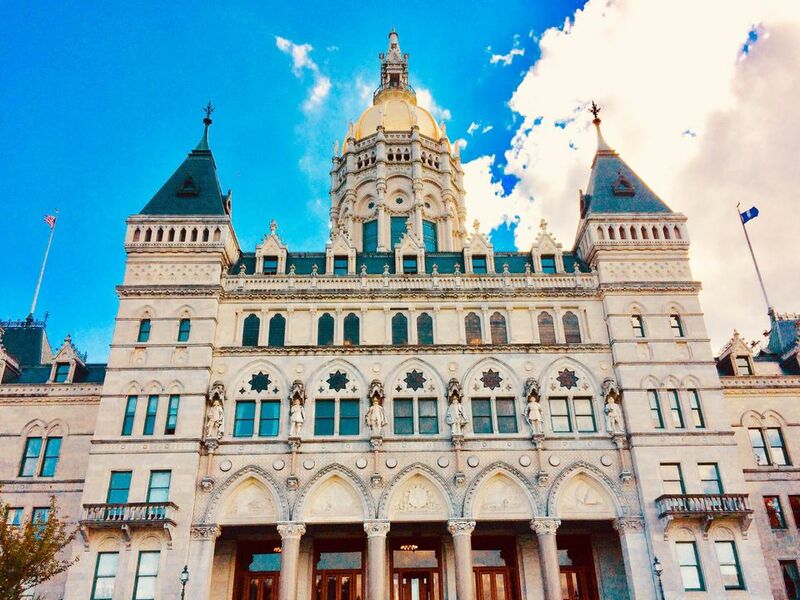 Whether you're planning your first visit to Connecticut's capital city or you're a resident looking for something fun and affordable to do in your own backyard, here's a quick look at 10 free things to do in Hartford. America's oldest public park is home to more than 125 tree species, some more than 100 years old. Pick up a free Bushnell Park Tree Walk brochure at the League of Women Voters desk at the entrance to the Legislative Office Building on Capitol Avenue in Hartford. The self-guided tour described in the brochure will take you through Bushnell Park and help you to locate more than 40 different species of trees. Although there is a small fee, don't miss the chance to ride Hartford's historic Bushnell Park Carousel. This Gothic brownstone monument honors the 4,000 Hartford citizens who served in the Civil War and the 400 who died for the Union. Free 20- to 40-minute Arch tours are available Thursdays only, noon to 1:30 p.m., May through October, weather permitting. The Ancient Burying Ground is the final resting place for many of Hartford's founders and early settlers, and you can visit anytime to explore on your own. Center Church, built in 1807, was modeled after St. Martin-In-The-Fields in London and features stained glass windows by Louis Tiffany. The church is open for free tours on a limited basis during the summer months. Hartford is home to the oldest municipal rose garden in the U.S. During the summer months, more than 15,000 rose bushes representing 800 different varieties of roses, heirloom and new, are in bloom. Elizabeth Park also has perennial and annual gardens, walking trails and greenhouses: It is a lovely landscape to explore year-round. The park is open daily. It's not exactly an attraction, but if you are a Katharine Hepburn fan and you happen to be in Hartford, you may want to pay your respects to the late star of more than 75 films by visiting her grave site. Hepburn was born in Hartford, Connecticut, on May 12, 1907, and following her death on June 29, 2003, she was buried in her family's plot at historic Cedar Hill Cemetery. Hartford's spectacular gold-domed State Capitol building was completed in 1878 and is a National Historic Landmark. Free one-hour tours begin in the adjacent Legislative Office Building (300 Capitol Avenue). Advance reservations are required for groups. Self-guided tours are also an option. See historical exhibits depicting Connecticut's history and heritage including the original 1662 Connecticut charter issued by the British Crown, a collection of Colt firearms, one of the best collections of American coins in the world and portraits of state governors, plus changing exhibits. The Hartford dash Shuttle is a free shuttle bus service that connects the Connecticut Convention Center and the riverfront with downtown hotels, restaurants, shops, and attractions. Take a free ride to reach a specific Hartford spot or for a quick tour of the city. Installed in 2005, this collection of 16 sculptures celebrates Abraham Lincoln's legacy and themes like equality and freedom. This map and guide will help you find them: Wear comfortable shoes and sunscreen, as these outdoor works of art are quite spread out. A mobile tour, which debuted in June of 2016, provides additional insights. This 1909 Georgian Revival mansion has been home to Connecticut's governors since 1945. Free tours are available by appointment for groups only.